Perhaps you’re only interested in the fancy-shmancy apps on your iPad—you know, the ones that are just versions of Mac apps, like Mail and Safari. But if you want to know what the iPad is really capable of, you’ll have to dig deep into its real workhorse app: Settings. Settings is where the nitty-gritty happens: where you can do things beyond even the capability of even the most powerful iPad app. I took a stroll through the app to find out what’s new and different on the iPad. The split-pane view, available in both portrait and landscape, makes Settings much more usable. First, the interface. In landscape mode, Settings uses the split-pane view that’s become so familiar to iPad users from Mail and elsewhere. In Settings’ left pane, you’ll find a list of the different categories of system settings and for apps (both built-in and third-party). On the right are the contents of whatever section you’re currently viewing. Apple’s clearly taken the time to ensure most sections don’t require you to dive more than one level down: for more involved tasks (setting up mail accounts, for example, or most tasks that require you to enter text), the iPad will often pop up a dialog box in the middle of the screen. This approach has the benefit of making sure that you don’t get lost in the interface: the rest of Settings is still clearly visible, though dimmed, behind the dialog window. Organizationally, there have been some changes, too: the iPhone’s Brightness and Wallpaper sections have been combined into one; Sounds now lives under General; and settings for third-party apps are now more clearly delineated. Otherwise, though, it looks pretty similar to the iPhone’s Settings in most places. The iPad’s not the iPhone, so there are plenty of new options here, as well as a few missing features. Many of the missing features are ones that were removed because of the lack of 3G connectivity on the Wi-Fi-only iPad—for example, the Wi-Fi-only iPad has no Airplane Mode slider. We expect many of these to return in the Wi-Fi + 3G iPad available later this month. 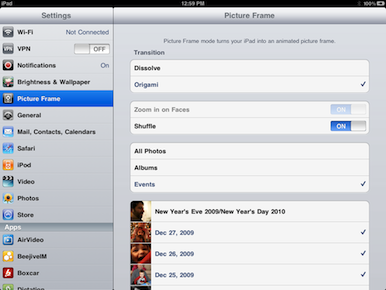 New settings let you use your iPad's lock screen as a digital photo frame. A brand new top-level section, Picture Frame lets you set up the iPad’s digital photo frame feature, which you can access from the device’s lock screen. You can choose between two transitions—the classic Dissolve and a nifty folding Origami effect—and select which photos you want the slideshow to pull from: all of your included photos, or certain albums or events. You also have the option to shuffle your photos, and, if you’ve picked the Dissolve transition, you can choose to have the photos zoomed in on detected faces (which is occasionally amusing, given Apple’s sometimes shaky face detection technology). The Origami transition automatically frames shots on faces, which is a nice touch. As mentioned above, Brightness & Wallpaper combines two sections from the iPhone’s Settings app. But what’s really new here is that not only can you choose a background for the iPad’s lock screen, you can also choose one to reside behind your Home screen. And, if you feel like it, they can even be two different pictures. Mail, Contacts, and Calendars are virtually identical between the iPhone and iPad, although the Wi-Fi-only iPad obviously doesn’t allow you to import contacts from a SIM card. Safari’s preferences now have a toggle switch to always show the browser’s Bookmarks Bar. Strangely, the Plug-Ins slider from the iPhone has disappeared. Under iPod settings, you won’t find the iPhone’s Shake to Shuffle feature, and the iPad has broken out the video preferences to a separate Video section, though it contains the same functions. The transition choices that appear in the iPhone’s Photos settings have moved to the iPad’s much more capable Photos app. 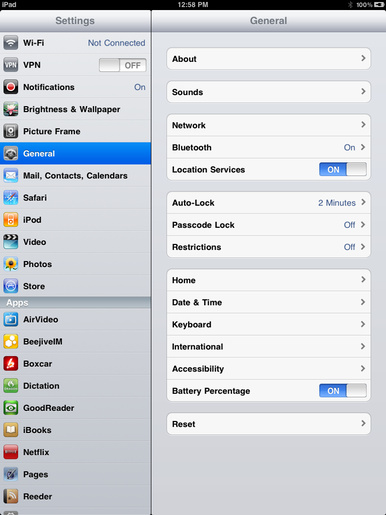 General contains the iPad’s systemwide settings. The Wi-Fi-only version lacks the iPhone’s Usage sub-menu, but it adds the Sounds subsection, which itself loses phone-related features such as Vibrate, Ringtone, New Text Message, New Voicemail, and so on. Under the Network subsection, you’ll find the iPad has the same VPN and Wi-Fi menus as the iPhone, and of course the Wi-Fi-only model doesn’t have the either the iPhone 3GS’s Enable 3G or Data Roaming toggles. If you set up a VPN connection, then you’ll be able to toggle it on or off from the top-level Settings list in the left-hand pane. The Auto-Lock options have changed slightly, as befitting the iPad’s more capacious battery: instead of the iPhone’s never and one to five minute options, the iPad starts at two minutes, with options for five, ten, or 15 minutes, in addition to never locking. Under Passcode, you’ll mainly find the same options as the iPhone, minus the 3GS’s Voice Dial option and with a new slider to turn the Picture Frame feature on or off. The Home button options are slightly altered from the iPhone: you can’t set double-clicking the Home button to Phone Favorites or Camera, naturally, but otherwise they’re identical. Under Date & Time, the Wi-Fi-only iPad doesn’t let you set the time automatically—since this is probably due to the lack of 3G networking, it may return in the Wi-Fi + 3G version. The Keyboard options have been rearranged slightly: there’s now a sub-option under International Keyboards to change the keyboard layout for both the software and hardware keyboards. With the English keyboard, you can changed the layout from the default QWERTY to AZERTY or QWERTZ, and you can have the hardware keyboard set up as U.S., Dvorak, U.S. International - PC, U.S. Extended, British, French, German, Spanish - ISO, Italian, Dutch, and Belgian. The iPad’s international keyboard options are far more limited than the iPhone’s, with only 12 choices in addition to the U.S. layout: Chinese (Simplified) Handwriting, Chinese (Simplified) Pinyin, Dutch, English (UK), Flemish, French, French (Canada), German, Italian, Japanese, Russian, and Spanish. However, when you add those additional keyboards, you often have the choice of several different hardware and software keyboard layouts. For example, under Russian you can set the hardware keyboard layout to Russian - PC, Russian, and Russian - Phonetic. 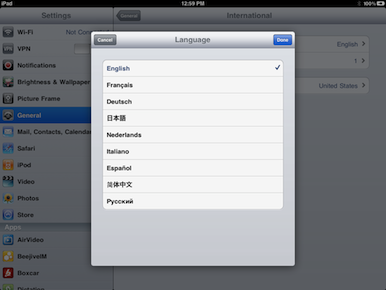 The iPad's interface is available in far fewer languages than the iPhone's. The iPad lacks the iPhone 3GS’s Voice Control feature, so it’s no surprise the Voice Control language options are missing under the International section. And if you want to change your iPad’s whole interface into a different language, you’ll face considerably fewer options than on the iPhone: the iPad only offers English, French, German, Japanese, Dutch, Italian, Spanish, Chinese, and Russian. Expect these choices to increase as the iPad sees release in more and more international markets. Accessibility is pretty similar to the 3GS, though the VoiceOver section adds options for using phonetics and pitch change. And the iPad also has the same toggle to show the battery percentage monitor as the iPhone 3GS does; you’ll find it under the General section. Sadly, there aren’t exactly any earth-shaking surprises in the iPad’s Settings app. You can expect changes as time goes on—especially in terms of additional functionality when the Wi-Fi + 3G iPad eventually gets released. Still, the addition of the split-pane interface makes Settings much easier to navigate, especially for quick changes like Wi-Fi networks, and overall it's a nice update.